Anoplodactylus evansi, copyright Claudia P. Arango. 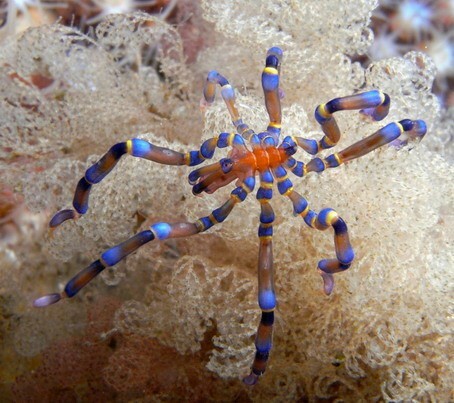 The Pantopoda is the clade containing crown-group sea-spiders. Members of this group have the trunk reduced to a single segment; other possible synapomorphies include the absence of excretory organs, the presence of gonopore openings on the second limb podomere, cement glands in the larval chelicerae, and egg-carrying by the males (Waloszek & Dunlop 2002). [GV09] Giribet, G., L. Vogt, A. Pérez González, P. Sharma & A. B. Kury. 2009. A multilocus approach to harvestman (Arachnida: Opiliones) phylogeny with emphasis on biogeography and the systematics of Laniatores. Cladistics 25: 1–30. [S86] Stock, J. H. 1986. Pycnogonida (=Pantopoda). In: Botosaneanu, L. (ed.) Stygofauna Mundi: A Faunistic, Distributional, and Ecological Synthesis of the World Fauna inhabiting Subterranean Waters (including the Marine Interstitial) pp. 698–700. E. J. Brill/Dr. W. Backhuys: Leiden.